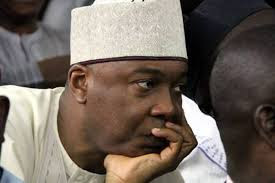 Two more suspected armed robbers arrested in connection with the high-casualty attack on banks in Offa, kwara State, in April, have implicated Senate President Bukola Saraki in their confessional statements. Jimoh Moshood, Force Public Relations Officer, said this in Abuja on Wednesday while addressing journalists. The latest link of Saraki to the Offa gang comes three days after five gang leaders who were part of a dozen that killed 33 people during the wide-ranging operation confessed that they were being sponsored with firearms, money and operational vehicles by the Senate President and Governor Abdulfatah Ahmed of Kwara State. As a result, the Police invited Saraki to the Force Intelligence Response Team office at Guzape, Abuja, so he can “answer allegations indicting him from confessions of five gang leaders”. However, Saraki was later informed a written explanation would suffice. His security aides — as well as those of Yakubu Dogara, Speaker of the House of representatives — were withdrawn by the Department of State Services (DSS) hours after. But they were restored on Monday, following protests by the new Peoples Democratic party (nPDP) bloc of the ruling All Progressives Congress (APC).